Despite some recent speculation that Packers tailback James Starks might be on the roster bubble in Green Bay, Bill Huber of Packer Report reports that Starks’ roster spot is “safe” as final cuts approach. A source told Huber that Starks will join Cedric Benson and Alex Green in the Packers’ backfield to open the season. Starks is currently recovering from turf toe, but the Packers seem to believe he will recover enough to be a 2012 contributor. In related news, we previously passed along eight of Green Bay’s early cuts. Rob Demovsky of the Green Bay Press-Gazette uncovered five more. Per Huber, the Packers have also released or waived defensive tackle Daniel Muir, running back Marc Tyler, wide receiver Diondre Borel, and fullback Nic Cooper. I’m sick of the preseason. The Cincinnati Bengals likely agree. 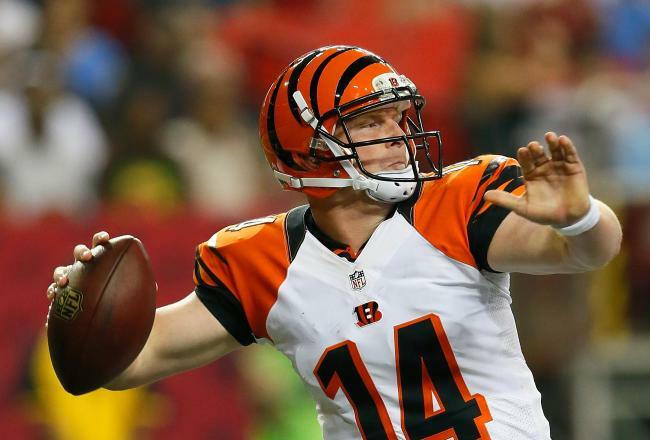 Starting quarterback Andy Dalton suffered an apparent injury to his throwing arm after being sandwiched by a pair of Colts defenders on the opening drive of Thursday night’s preseason game. He got up after being struck by Colts linebacker Robert Mathis. Moving slowly, Dalton flexed his fingers. Later, he was sitting on the turf near the Bengals’ bench, with trainers attending to him. The announcers explained after a commercial break that trainers were checking Dalton’s elbow. He currently is one the sidelines, and he seems to be OK.
Maybe Robert Griffin III was just listening to the Redskins pre-game show? Or maybe the Redskins’ old school radio announcers are just showing their age. 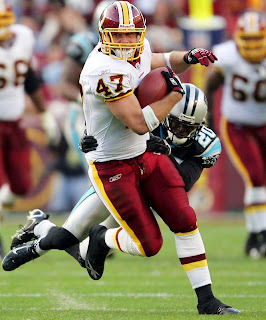 Dan Steinberg of the Washington Post notes the rookie quarterback has changed his routine, dropping the headphones he was wearing prior to the first two games after being criticized by Sonny Jurgensen. Apparently, according to Steinberg, Jurgensen made some disparaging remarks about the headphones during the second broadcast, and lo and behold, RG3 came out bare-eared for the Colts game. At once, you want to respect Griffin for deferring to the legendary quarterback of the franchise he’s been asked to save from itself, if that’s what happened. At the same time, you wonder why Jurgensen chose this particular thing to make an issue of. There will be folks who accuse Jurgensen of sinister motives. I think it’s probably just an old-and-out-of-touch issue more than anything. Either way, it gives you one more reason to keep an eye on RG3 tonight, as if Redskins fans needed one. Though it doesn’t qualify as much of a surprise, the Seahawks have decided to put an early end to the Terrell Owens experiment. The 38-year-old wideout was never a lock, but didn’t help his case by reportedly being a complainer. Given that he’s now blown through coach Pete Carroll’s camp, and Carroll has become the Father Flanagan of the league, it’s hard to imagine Owens getting many more chances. The Buccaneers opened the preseason rotating running backs LeGarrette Blount and Doug Martin with the first-team offense. In Thursday night’s regular-season tuneup against New England, however, Martin started the game for the first time. The rookie was in the game for Tampa Bay’s entire first possession, operating as an every-down back, and punched it in from a yard out to give the Bucs an early 7-0 lead. Stephen Holder of the Tampa Bay Times confirms Martin was promoted ahead of Blount based on performance, not due to injury. Martin played tailback for the Bucs’ entire second possession, as well. Blount was on the sideline. 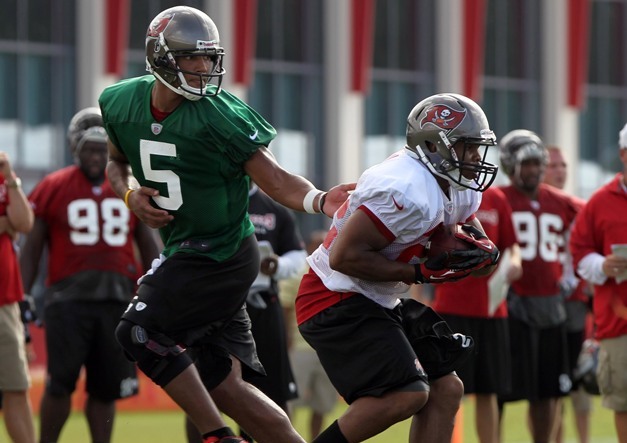 Barring something unforeseen, Martin will be the Buccaneers’ starting running back on opening day. And Blount will be a backup. The Seattle Seahawks may be seeing the same Terrell Owens who has worn out his welcome in several other stops around the NFL. According to the Tacoma News Tribune, Owens still appears to be the same T.O. who complains when things are not going his way, and that’s something Seahawks coach Pete Carroll will not tolerate. No specific examples of Owens complaining are cited in the Tacoma News Tribune report, but even if Owens were a model citizen he wouldn’t necessarily have a great chance of making the Seahawks’ 53-man roster. Owens failed to catch a pass in the preseason game against the Broncos, but he did drop one. Braylon Edwards, meanwhile, has looked very good, both in practice and in preseason action. It appears that Edwards has just about locked up one of the roster spots for a wide receiver. Which means there’s one fewer spot available for Owens, who may be in jeopardy of seeing his last chance at a return to the NFL disappear. 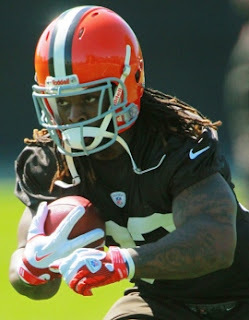 Browns running back Trent Richardson’s rehab from arthroscopic knee surgery is progressing well enough that team president Mike Holmgren said Wednesday that he should be back on the field next week. Richardson was scheduled to run in a pool on Wednesday, Holmgren said during an interview with Sport Time Ohio passed along by Mary Kay Cabot of the Cleveland Plain Dealer. If that goes well, Richardson will graduate to running outside and he “should be back on the field doing something next week” assuming his knee cooperates with the increased workload. All of which leads to the question of whether or not he’ll be able to play in Week One. Holmgren said that there’s a chance Richardson will be able to join fellow rookie Brandon Weeden in the lineup, but that the team is going to be smart about moving things forward. Richardson’s had two knee surgeries this year, which makes getting him back for Week One less important than making sure he doesn’t wind up with the hat trick. After all, the Browns drafted Richardson, Weeden and wide receiver Josh Gordon with the idea that they’d be the foundation of the offense for a lot more than just this year. The sale of the team to Jimmy Haslam has shaken up the future significantly, but not enough that losing Richardson to a serious knee injury is going to help anyone’s chances of sticking around. 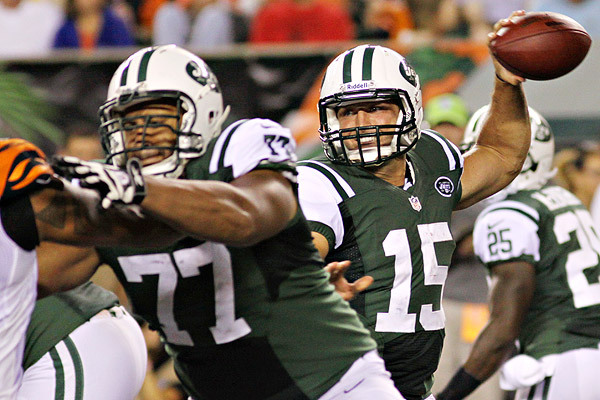 Jets quarterback Tim Tebow struggled on Saturday night, as did the entire offense in a 26-3 loss to the Giants. And the Giants said after the game that they could see Tebow was getting frustrated — which Tebow acknowledged. “I was probably just frustrated because we want to get on the same [page] and have it run smooth,” Tebow said, via the Star-Ledger. Giants defensive tackle Carlton Powell said he and his teammates could see that frustration, and Powell said he tried to add to that frustration by getting under Tebow’s skin with some post-play comments. Powell admits he said something to Tebow that was “not very appropriate,” and he said he thought he Tebow was growing angrier as the game wore on. After a loss in which the Jets’ offense averaged just 2.6 yards a play, everyone on the offense has plenty of reasons to be upset. 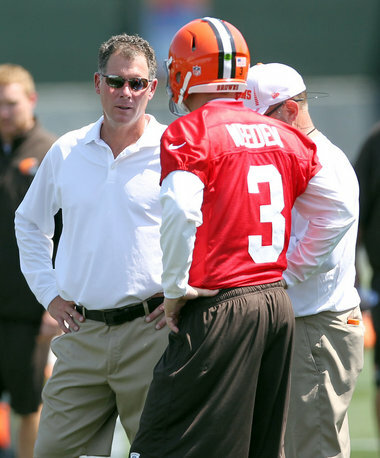 A guy who was born to be a quarterback also may know a thing or two about coaching. In Brett Favre’s debut as offensive coordinator at Oak Grove High School in Hattiesburg, Mississippi, Favre’s team pulled off a 64-6 win over Sumrall. The reality is that Sumrall was overmatched physically by Oak Grove. Favre is coaching on an unpaid basis. After Friday night’s performance, Oak Grove should offer to double his salary. As well as things went for the Panthers in the first half of last night’s win over the Dolphins, they had a bit of a scare from their new money man. 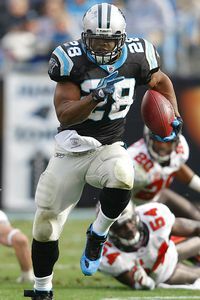 After scoring an early touchdown, running back Jonathan Stewart hobbled off the field with a trainer, but walked back a few minutes later after getting checked out. “He got kicked in the calf and we just wanted to be cautious,” Panthers coach Ron Rivera said after the game. Stewart, who signed a five-year contract extension last week which included $23 million guaranteed, was well enough to be seen dancing on the sidelines in the second half, clearly not bothered by the problem. Starting center Ryan Kalil and right tackle Byron Bell also had to come out briefly after they got their feet stomped during the game, but X-rays on both were negative. Those were the only negatives for the Panthers first offense, which rolled to a 17-0 lead in the first quarter and was up 20-7 at halftime. Cam Newton was a clean 8-of-11 for 119 yards and a touchdown. The offense which ranked fifth in points and seventh in yards last year looked much more polished than in last week’s yawner against the Texans, and having Stewart healthy will be a key component in moving that forward. The Mike Wallace watch stretches on in Pittsburgh, but inside the Steelers' locker room, the wide receiver's teammates believe he's about to show his face. That's according to plan. Wallace is expected to rejoin the team before the start of the season after skipping OTAs, minicamp and all of training camp through this week. Wallace wants a long-term deal; the Steelers want him to sign his $2.742 million tender. 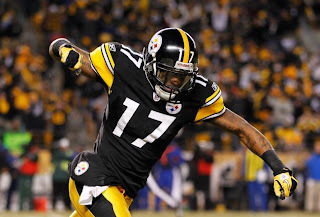 The Steelers historically don't negotiate with holdouts, which contributes to the theory Wallace eventually will cave. "There's a little buzz around the team that he'll be coming back pretty soon," receiver Emmanuel Sanders told the Beaver County Times. "I don't know the exact date, but it's looking pretty good." It's unlikely to happen before the Steelers returns to team headquarters in Pittsburgh next week. That would give him at least a few weeks to learn Todd Haley's new offense. The Steelers have been advertised as building a run-first offense, but don't believe it. Yes, they'll pound the ball, but Haley loved the pass in Arizona and has one of the game's premier quarterbacks in Ben Roethlisberger. This is a different team if Wallace stays away, but the Steelers aren't about to trade him. It's one of the offseason's final, lingering contract dramas. One that might be nearing an end. In another indication that the Titans’ quarterback job is Jake Locker’s to lose, coach Mike Munchak said today that if Locker continues to do through the rest of the preseason what he has done so far, he’ll beat out Matt Hasselbeck for the starting job. Locker played better than Hasselbeck in the preseason opener, although neither quarterback was great. Munchak said he wants to see Locker get the Titans’ first-string offense into the end zone on Friday night against the Buccaneers. 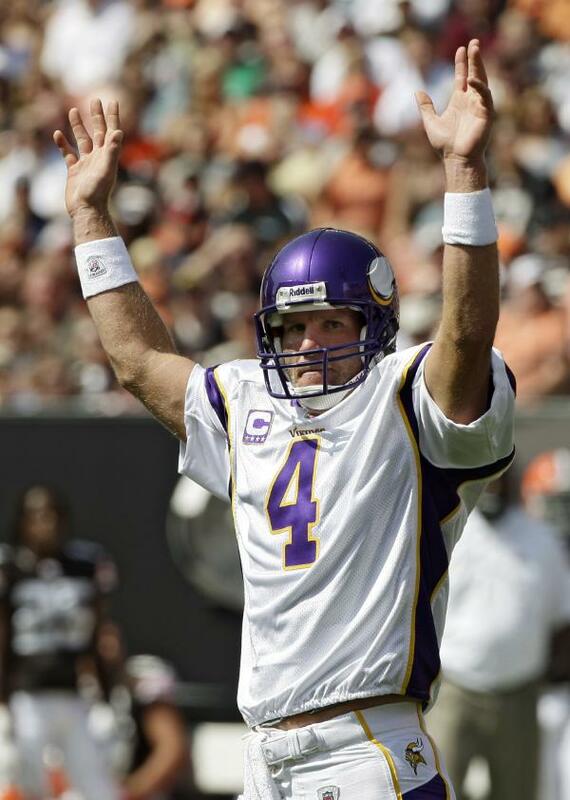 Locker has never started an NFL game, while Hasselbeck has 147 regular-season starts in his career. But Munchak said he doesn’t think Locker’s lack of experience is an issue. Locker will get his first preseason start on Friday. And it’s sounding more and more like he’ll get his first regular-season start on September 9. Seahawks coach Pete Carroll has been thrilled with the results after adding a couple of veteran wide receivers whose off-field issues have at times overshadowed their on-field talents, Braylon Edwards and Terrell Owens. 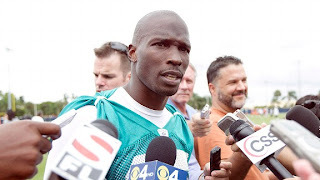 So does that mean Carroll will try to make it a trifecta and bring in Chad Johnson? Carroll said on ESPN’s NFL 32 that he’s very pleased with what he has seen from Edwards and Owens, and those two are all the veteran receivers he needs to add. When asked if he would consider Johnson, however, Carroll seemed to regard it as a ridiculous question, and sounded like he was trying to stifle laughter. That’s probably what every other NFL head coach would say about Johnson right now. 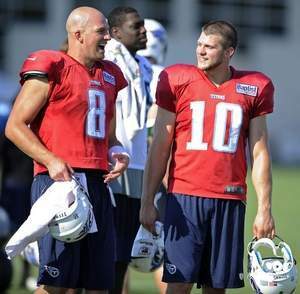 Jake Locker has moved ahead of Matt Hasselbeck in the Titans’ quarterback competition. At least for one preseason game. Titans coach Mike Munchak confirmed today that Locker will start Friday’s preseason game against the Buccaneers. It will be Locker’s first start for the Titans after Hasselbeck started all 16 regular-season games and all four preseason games last year, and also started the preseason opener against the Seahawks this year. But Locker outplayed Hasselbeck in that preseason opener, and that made the quarterback competition close enough that Locker is getting his first chance to start. Munchak said he’s looking forward to seeing how Locker handles the opportunity, and that he expects Locker and the first-string defense to get about 20 plays against the Buccaneers. Locker saw extensive action in three games last season and played fairly well, completing 34 of 66 passes for 542 yards, with four touchdowns and no interceptions. If he turns in a big game against the Bucs on Friday night, he may be ready to unseat Hasselbeck permanently. Lee Evans didn’t last long in Jacksonville. The Jaguars announced today that they’ve released Evans, a free agent receiver they signed in April. Jacksonville drafted receiver Justin Blackmon shortly after signing Evans, a pick that made Evans expendable, so it’s not surprising that Evans has been released shortly after Blackmon signed. Laurent Robinson is expected to start alongside Blackmon this season, with Cecil Shorts and Mike Thomas behind them on the depth chart. 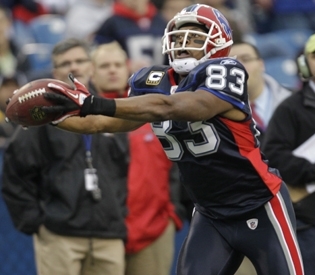 A 2004 first-round draft pick of the Bills, Evans was traded to the Ravens a year ago and had by far his worst NFL season in Baltimore, catching just four passes in the regular season while battling foot and ankle injuries. In the playoffs he dropped a potentially game-winning touchdown pass that could have given the Ravens a victory over the Patriots in the AFC Championship Game. Now Evans is out of work again, and at age 31 he may be running out of opportunities to play in the NFL. 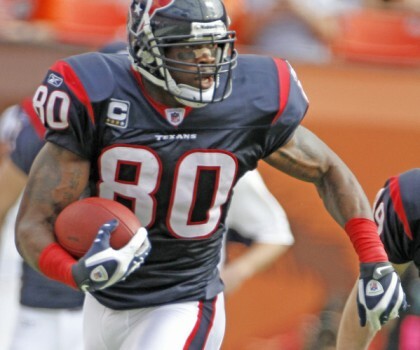 Texans wide receiver Andre Johnson has resumed practicing since an early-camp groin injury, and isn’t known to have suffered any setbacks. But the organization is playing it cautiously with its 31-year-0ld, All-Pro skill-position player, deactivating Johnson for Saturday night’s preseason opener against the Panthers. Per Nick Scurfield of the Texans’ website, impressive rookie Keshawn Martin will start in Johnson’s place. Martin appears to have passed spring sensation Lestar Jean on the depth chart. Among Houston’s other notable inactives are linebacker Brian Cushing (virus) and defensive end J.J. Watt (elbow dislocation). Cushing, like Johnson, should be fine. Watt is due back by Week One. Hours before the Chiefs open their preseason schedule at Arrowhead Stadium, reports out of Kansas City say that unsigned franchise player Dwayne Bowe is about to rejoin the team. KMBC 9 News in Kansas City is reporting that Bowe has reached an agreement with the Chiefs, and that he was flying to Kansas City on Friday afternoon. Because Bowe and the Chiefs did not reach an agreement before the July 16 deadline for franchise players to sign long-term contracts, he can now only sign a one-year deal with the Chiefs. So he has presumably decided to sign his franchise tender, which guarantees him a 2012 salary of $9.5 million. He’ll then become an unrestricted free agent again in March, or get franchised again with a tender amount of $11.4 million. The Chiefs’ No. 1 receiver, Bowe caught 81 passes for 1,159 yards and five touchdowns last season. 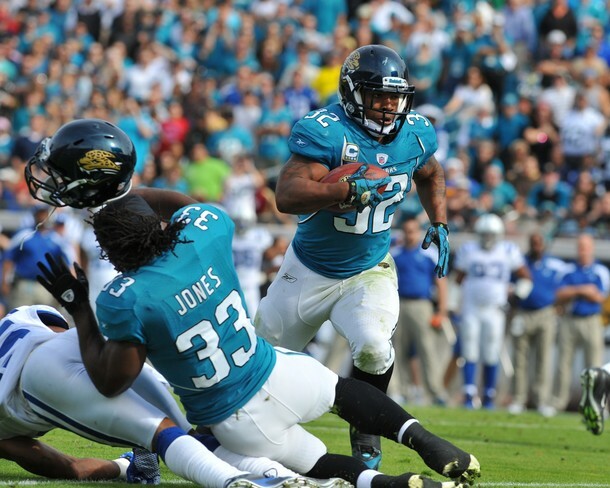 Don’t expect Maurice Jones-Drew’s holdout to end soon. Although Jones-Drew’s camp and the Jaguars are in regular contact, his holdout is expected to last until the end of August and possibly into September, ESPN’s Adam Schefter reports. Schefter reports that the Jaguars and Jones-Drew have been speaking almost every day during training camp, and that the communication is “cordial.” You know, except for the part about how Jones-Drew is refusing to show up for work until the Jaguars give him more money, and the Jaguars are telling him he can either honor his contract or find a new line of work. Jones-Drew still has two years left on the five-year, $31 million contract he signed in 2008. Eventually, he’s likely to get back to work and play for the $4.5 million he’s slated to get paid this year. But that’s probably not going to happen until just before the start of the regular season. Adrian Peterson remains determined to play in the Minnesota Vikings' season opener. He needs to get on the practice field first. Peterson, who tore the anterior cruciate and medial collateral ligaments in his left knee last December, has yet to be fully cleared for training camp. There's hope that can change next week. "I'm looking forward to being out here pretty soon. I've been out for like two weeks, and it's time to get going," Peterson said, via The Associated Press. "I know that they understand that, and they've been watching and they've been getting good feedback. So I'm sure they are pretty much as excited as I am." Peterson said he has given up trying to push coaches into letting him play, but Leslie Frazier sounded optimistic about his star running back. "Everything I'm hearing is extremely positive, so we'll see where we are," the coach said. "Everything he's done, he's right on point, but I say that without him ever participating in a drill with his teammates." 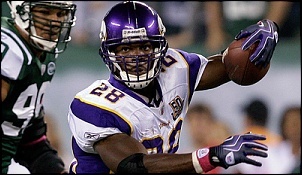 Peterson arguably is the greatest running back of his generation, but the Vikings need to be careful. Peterson badly wants back in, but that's expected. He also pointed to his patellar-tendon area Wednesday and said it still "feels funny." That's all part of the recovery process, but the big picture should be the only picture here. The Vikings are rebuilding. There's no need to bring Peterson back unless he's 100 percent ready to return. 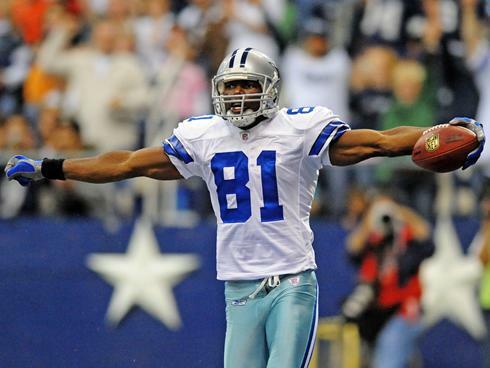 Terrell Owens, Braylon Edwards death match on tap? Terrell Owens is now a member of the Seattle Seahawks. Will that still be the case a month from now? Pete Carroll loves himself a reclamation project, but Owens is guaranteed nothing. If anything, the 38-year-old veteran might have to find a way to leapfrog other receivers on the roster. Can he do that? Let's take a look, breaking down Seattle wideouts into three groups. Rice is being brought along slowly after offseason shoulder surgeries and is just one year into a fat free-agent contract. Baldwin was the Seahawks leading receiver last season (788 yards, four TDs) and is a good fit for the slot. Seattle hopes this is the season Tate emerges as a consistent playmaker. Obomanu has the strongest résumé here, finishing last season with 436 yards and two touchdowns. Lockette has put himself on the radar with a strong start to training camp. Durham is a project, a fourth-round draft pick in 2011 who has both size (6-foot-6, 216 pounds) and versatility. Brandon Weeden is officially the Browns starting quarterback. The announcement came Monday, but it had been expected by just about everyone since the Browns took Weeden in the first round in April. Not included in “just about everyone” was Colt McCoy, who thought he had a shot at a starting job after ending last season atop the Cleveland quarterback totem pole. McCoy said that coach Pat Shurmur told him that Weeden would be the starter before he made the announcement to the media, although McCoy’s comments suggest that there wasn’t much need for such formality. 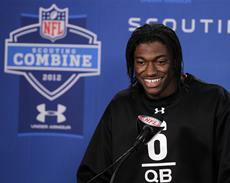 According to McCoy, any talk of a quarterback competition was nothing more than empty words. It’s hard to believe McCoy didn’t see this coming, but you can understand being disappointed that the starting job went to someone else. McCoy passed on saying he wanted to leave the Browns via trade or other means, which was a smart course of action. Making a stink isn’t going to help him. If he wants out of Cleveland, the best thing he can do is play well in the preseason and hope that another team comes calling. If he doesn’t want out of Cleveland, well, it would be hard to believe McCoy doesn’t want out of Cleveland. 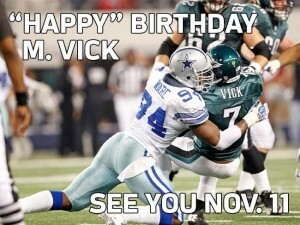 Eagles G.M. Howie Roseman announced moments ago that Garrett Reid, the eldest son of Eagles coach Andy Reid, was found dead at training camp on Sunday morning. “He’s been strong for us, we’re going to be strong for him right now,” Roseman said. Lehigh University Chief of Police Edward Shupp confirmed that Garrett Reid’s body was found in his dorm room at training camp, following a 911 call placed at 7:20 a.m. ET. Shupp added that at this point there is no evidence of foul play. A member of the coroner’s office said that an investigation is ongoing. We extend our deepest condolences to Coach Reid, his family, the players, the coaches, and all members of the Eagles organization. David Garrard the early Miami Dolphins' QB favorite? Publicly, Miami Dolphins coach Joe Philbin says the Dolphins' quarterback competition is wide open. 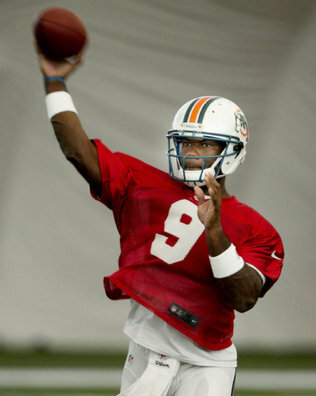 He noted recently that David Garrard and Matt Moore's practice stats are nearly identical. We also saw where Miami Herald columnist Armando Salguero wrote that he believes Ryan Tannehill and Moore are essentially battling to be Garrard's backup. It feels a little early to say that, but Garrard looks like the leader in the clubhouse. Finally, we were interested in how Philbin runs his Dolphins practice. To limit time in the sun, the Dolphins are practice at breakneck speed. "To get his quarterbacks enough work, he decided to have stereo 11-on-11 scrimmage sessions in the padded practices, one quarterback taking a snap and running a play, followed in seconds by the other quarterback taking a snap and running a play in the opposite direction. Brilliant," King wrote. "And it makes for a practice that seems to set land-speed records. I've never seen anything quite like it." There's another thing to look forward to on "Hard Knocks" : Turbo-charged practices. “I don’t know where it came from but they were like, ‘They ought to go for two every time this year.’ That might make sense,” Ryan said. Intrigued by the notion, Ryan gave it some thought. He said that it’s not realistic to simply do away with the one-point extra point, but it is realistic to think the Jets can feel much more confident than most teams when they go for two, thanks to Tebow. “Now, we’re not going to, I can tell you that right now, but I can understand where the guy’s coming from, whoever came up with that, because it’s 11-on-11 football and he’s a 250-pound man who’s running downhill at you, or throwing. That’s the other thing. 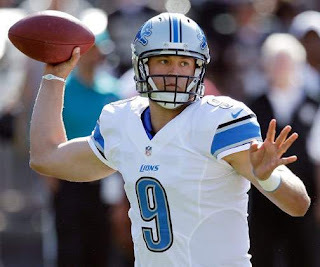 It’s not just that he can run it but he can throw it as well,” Ryan said. Obviously, no team is ever going to go for two after every touchdown. There are certain game situations when having a nearly 100 percent chance of making a one-point extra point is a much safer bet than going for two. But if there’s a team that has good enough personnel for goal-line situations that it believes it can convert a two-point conversion more than 50 percent of the time, then that team should go for two most of the time. So far, there’s never been a team that took that approach: The one-point conversion is the default choice for every team. But maybe Ryan can be persuaded to use Tebow on two-point conversions even when the “chart” says he should kick. 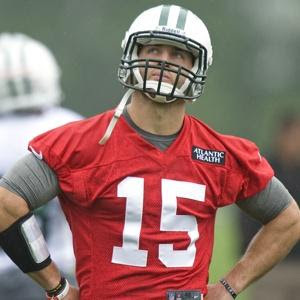 Ryan might just be enamored enough with Tebow’s skills to defy conventional wisdom, and regularly go for two. Michael Gehlken of the Union-Tribune San Diego reports that Chargers receiver Robert Meachem suffered a possible injury in Wednesday night’s training camp practice. 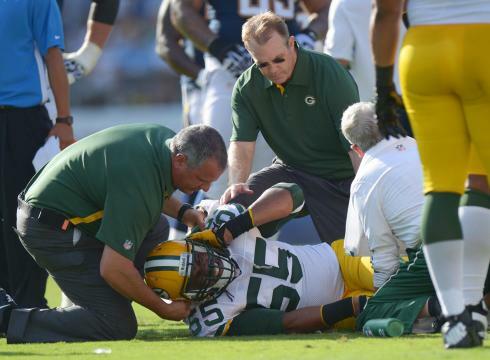 Per Gehlken, the injury was to Meachem’s right leg, and possibly his right knee. Meachem has had right knee problems since his rookie year in New Orleans. He had the same knee scoped this past offseason. Gehlken reports Meachem was able to walk off the field on his own power Wednesday night, which is a good sign. Coach Norv Turner stated in a post-practice presser that he doesn’t believe Meachem’s injury was anything serious, allowing that he still needs to speak to the Chargers’ head athletic trainer. At this point, the injury sounds like no more than a tweak. The Chargers signed Meachem to a four-year, $25.9 million contract in March. Chargers running back Ryan Mathews got off to a slow start last year when he failed to pass a conditioning test. This year, there’s another early obstacle to overcome. 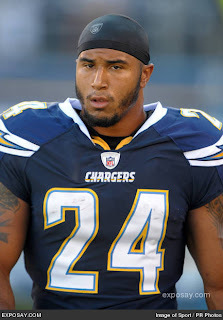 According to Debbi Baker of U-T San Diego, Mathews suffered “minor injuries,” in a two-vehicle collision. According to the California Highway Patrol report, Mathews was entering Interstate 8 when he lost control of his BMW and hit another vehicle. He was taken to a hospital after complaining of pain. The CHP said speed was a factor in the accident, but no one in the other car was injured. Hopefully, he recovers in time to do so, and doesn’t throw away a golden opportunity.